After having lunch in Nara, we were back in Osaka. This time we checked out Osaka Castle. Since buses are not allowed to enter, it is quite a distance to walk to the castle. 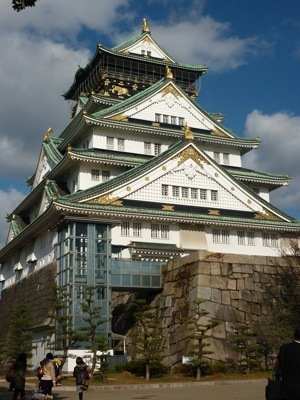 Osaka Castle is a true refection of Japanese architecture. According to the tour guide, the huge walls were built by pure human labor hundreds of years ago using big slabs of stones. The castle is surrounded by moat – just like the castles we see in fairy tales. Once, this was the venue where all military commands were issued. We didn’t go up but one can take a lift to the higher floors of Osaka Castle to have a better vantage point of the city. A fee is chargeable to go up this castle – which was built in 1583. Osaka Museum of History is located in the vicinity of the Castle. It was this place that we tried takoyaki – a popular Osaka snack of fried squid fritter. Not the taste I expected but it was okay.